Let the technology of an infrared camera pinpoint problem areas where moisture is damaging your home. A thermal imaging home inspection can help you save money on repairs and heating and cooling expenses. That means a more comfortable home and more money in your pocket. Infrared thermography is a fast and non-destructive technology that can accurately track down sources of moisture in the buildings using an infrared camera. Infrared can track down sources of moisture even when it's hidden behind interior walls, within insulation, or in the ceiling. It can also confirm when a wall or assembly is in fact dry. An infrared camera detects thermal anomalies by imaging the infrared energy that is being emitted, reflected or transmitted through or from surfaces, not by reading moisture content. While thermal imaging inspections are a valuable asset, it cannot be used as a sole source for determining deficiencies in a building envelope. Knowing what you are looking for and where to look are extremely important. Verifying infrared readings with moisture probes, intrusive test cuts or other test methods is always recommended to minimize the possible misinterpretation of infrared images. In the past contact moisture meters were the best equipment and method to detect moisture in buildings. However, they have to be placed on the surface every so many inches. This was time consuming and expensive. Testing an entire building with a contact moisture meter would be time consuming and expensive. 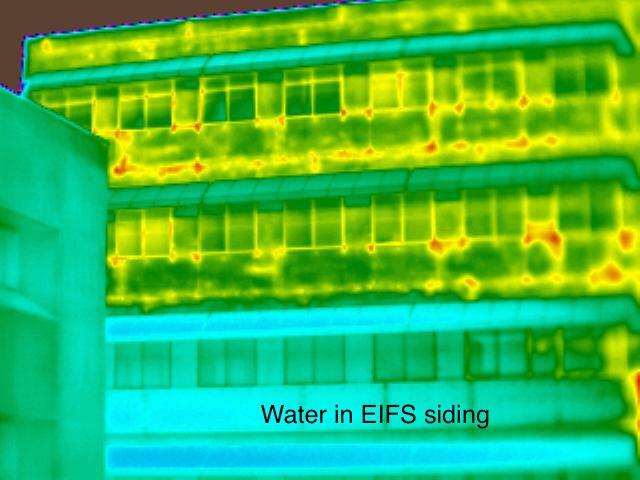 Thermographic imaging can accurately locate building moisture issues and track to their source of origin. You can inspect places that can’t be physically reached with moisture meters. Once repaired, you can monitor the drying process and confirm when the moisture is gone. With infrared technology, you can identify the location of problem areas with high accuracy, taking the guess work out of trying to find issues hidden within walls, and ceilings or roofs. This saves valuable time over traditional visual methods or contact moisture meters. When Do You Need Infrared? In floor radiant heating pipes are imaged to find leaking under the concrete. This prevents the contractor from removing large sections of floor to repair a small leak. Moisture infiltrates flat roof structures and finds its way into the insulation. This insulation has no ventilation and therefore can never dry out. Eventually, this causes the roof to rot and will ultimately shorten the life of your structure. Water infiltration into low-slope roofing systems causes changes in their thermal properties. Usually conducted at night, thermal imaging can help technicians identify latent moisture, as well as missing, damaged, or improperly installed insulation. All anomalies should be verified with invasive testing. Mold is a very serious problem that has forced people to abandon homes, offices, and schools. Thermography can detect the infrared signature caused by moisture damage to drywall, insulation, and other building materials. The first step in eliminating mold is to quickly and accurately locate and remove all sources of moisture before mold grows. Construction defects: Moisture can infiltrate siding, brick veneers, stucco, stone and other facades used on buildings, especially if they are not properly installed. Without an infrared camera, it is very difficult to find the leaks caused by these weatherproofing systems. When left undetected, moisture that makes its way through the façade of a building can wind up damaging ceilings, floors, and walls within the structure itself. With infrared technology, you can identify the location of problem areas with extreme accuracy, taking the guess work out of trying to find issues hidden within walls, and ceilings or roofs. This saves valuable time over traditional visual methods or contact moisture meters. Infrared thermography can be used in a post-disaster inspection to quickly and accurately evaluate the extent of water damage and monitor the drying process.